I use many different gemstones and natural stones & minerals in the jewelry I make. I thought it might be nice to do a series on some of the different stones. So in addition to the 10 part History of Jewelry series, I'll be doing a series on various stones I use. The first will be on Rose Quartz. This is a new gemstone that will be added to Bella Ornamenti. 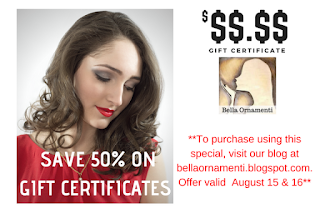 **DISCLAIMER** Bella Ornamenti and Andrea Walser do not make any medical claims regarding the use of gemstones. All information contained on this web site, including information relating to medical and health conditions, products and treatments, is for informational purposes only. Please see your doctor or health care professional before starting any alternative treatments, diets, supplements or exercise programs. "The fair and lovely Rose Quartz, with its gentle pink essence, is a stone of the heart, a Crystal of Unconditional Love. It carries a soft feminine energy of compassion and peace, tenderness and healing, nourishment and comfort. It speaks directly to the Heart Chakra, dissolving emotional wounds, fears and resentments, and circulates a Divine loving energy throughout the entire aura. Reawakening the heart to its own innate love, it provides a deep sense of personal fulfillment and contentment, allowing one the capacity to truly give and receive love from others. 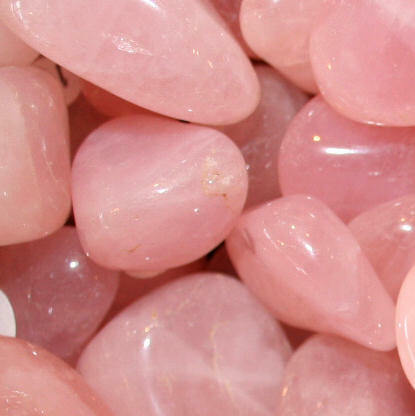 Rose Quartz also inspires the love of beauty, in oneself and others, in nature, and especially that which stimulates the imagination - art, music and the written word. [Melody, 570] Prized in the ancient world for its powers of physical beautification, facial masks of Rose Quartz have been recovered from Egyptian tombs, thought by the Egyptians and Romans to clear the complexion and prevent wrinkles. It was also a stone honored by the Tibetan and Oriental cultures, and continues to be one of the major carving stones of China.